After an intensive search of the 'net, I was unable to come up with any real historical background on this particular vehicle. Thus I am forced to quote from the instructions, which gives the same info for all of these PST fire truck kits! "The production of the PMZ-2 fire trucks was initiated in the Soviet Union before the Second World War. The fire-fighting units of the Red Army Air Forces, large military garrisons and storage facilities as well as city fire departments were equipped with these vehicles. Attached equipment of the PMZ-2 could be installed on different types of truck chassis. At first the ZIS-5 chassis was chosen as the only acceptable vehicle. Later a small batch of PMZ-2s were built on ZIS-6 frames. During the war years the ZIS-6 was discontinued and the production of the ZIS-5 was greatly reduced. This meant that near the end of the war (1944-45), firefighting equipment was installed on on the chassis of the ZIS-42 half-track and the US-6 Studebaker truck. 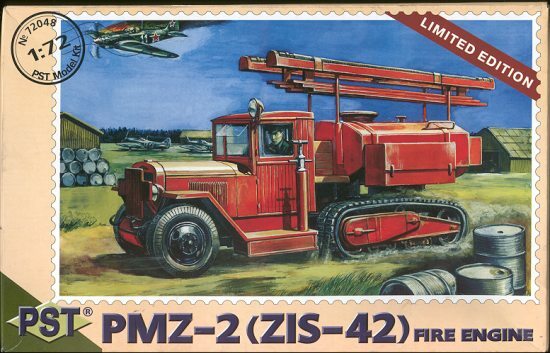 PMZ-2 fire trucks served in Soviet fire fighting units for almost twenty years and were phased out by the mid-1950s. Opening the box, you'll find four sprues of different colors in a polybag. One of these you've seen before in the US-6 version of this fire truck. Two of the others are for the base ZIS-6 truck and one is for the special half-track version. As with the other kits in this series of fire trucks, there will be a number of parts that are not used and this is clearly shown in the instructions. As with other PST kits, the molding of the parts is really very good. Detail is super and quite well done. Apparently the ZIS-6 truck is a popular kit as the one sprue for the basic truck shows some flash that is not on the others. As for ejector pin marks and sink marks, there are some of each, though they are in locations that are either very easy to fill/remove or won't be seen once the kit is built. As with other PST kits, the instructions are very well done. There are color callouts were needed using H (for Humbrol?) numbers and generic colors are used so painting shouldn't be a problem. The instructions show a metal rod to be trimmed for the drive shaft. Frankly, I couldn't find this in the kit so it appears that one will have to be made from stretched sprue. Shouldn't be a problem for most of us. No decals are included so that shouldn't be a problem. The overall color is bright red as is fitting for a fire truck! If nothing else, it will be a most interesting model when finished. There are a lot of small parts in it so I wouldn't recommend it for beginners, but the rest of us should have no problems with it.